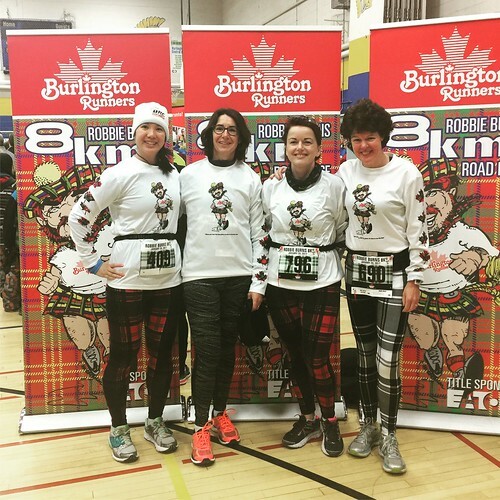 2018 marked my third year running the Robbie Burns 8k race in Burlington. 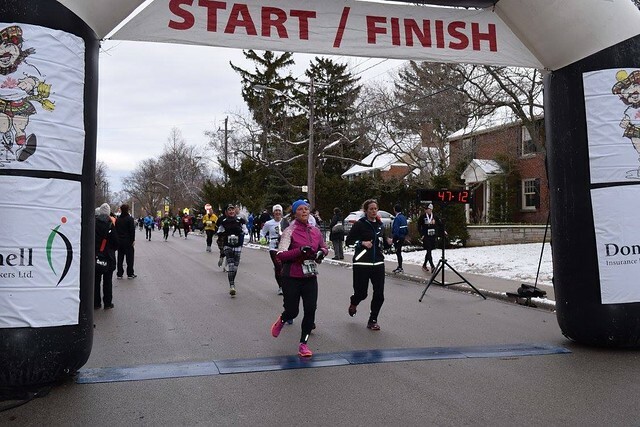 This was also my first race of the new year. 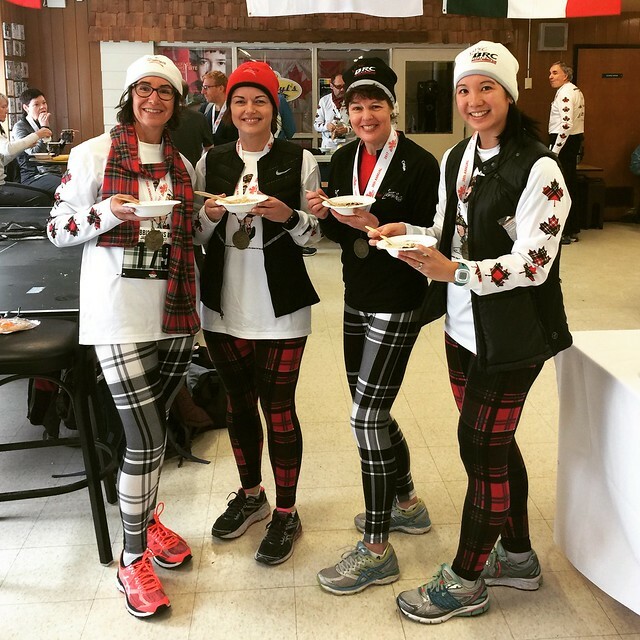 Sam, Nanlee, Jane and I try to run Robbie Burns every year (though they started in 2015 and Jane couldn’t make it this year). It’s become an annual tradition. 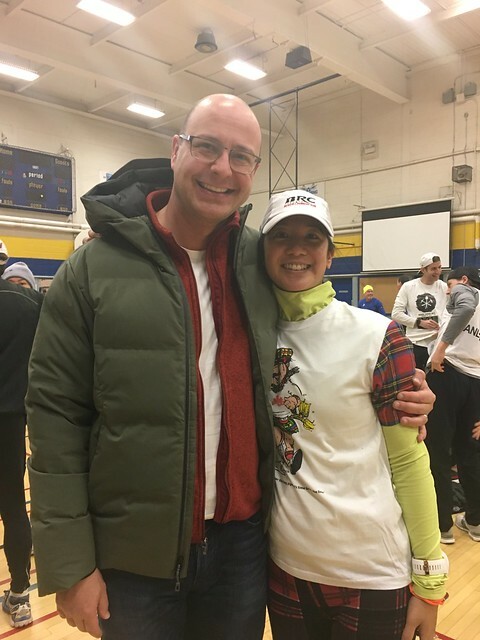 We carpool, find Tim and take a picture together (he’s always coaching several runners at the race and this year he also ran it), eat porridge together, stay for the draw prizes (we never win) and then get brunch or breakfast before heading home. It’s an all day affair. 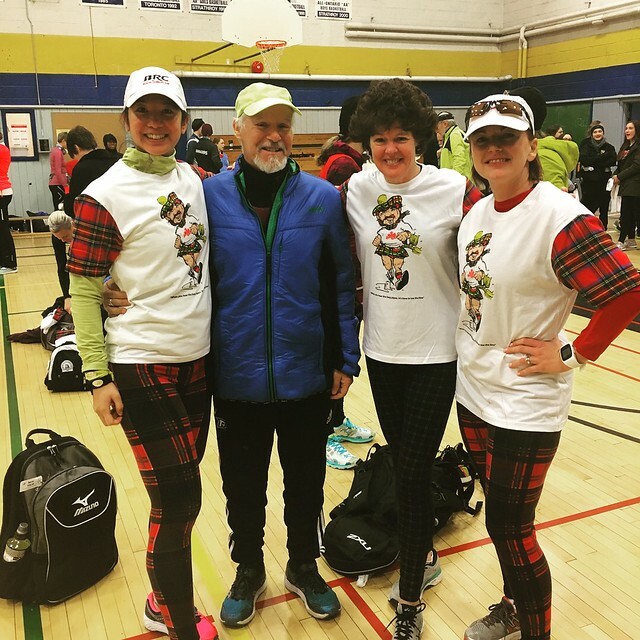 Me, Jane, Nanlee and Sam at the 2017 Robbie Burns 8k race, sporting the 2016 shirt. 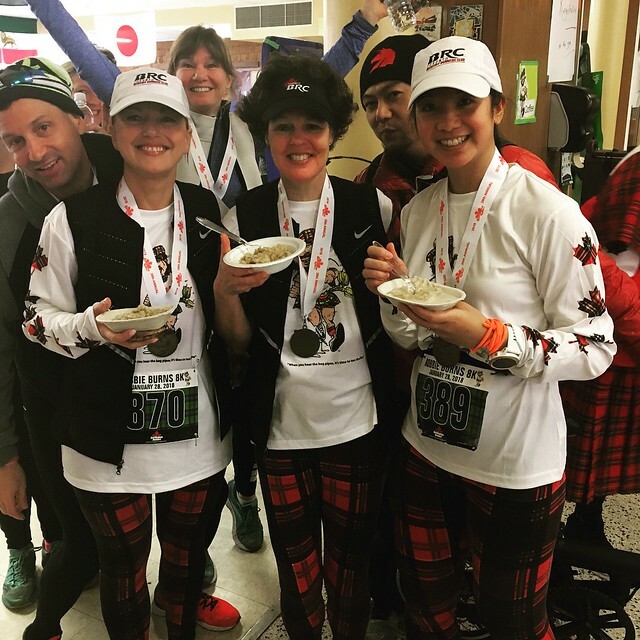 Me, Jane, Tim, Sam and Nanlee at the 2016 Robbie Burns 8k Race. Robbie Burns is a mainly flat course, though the last two kilometres are challenging with some little hills. 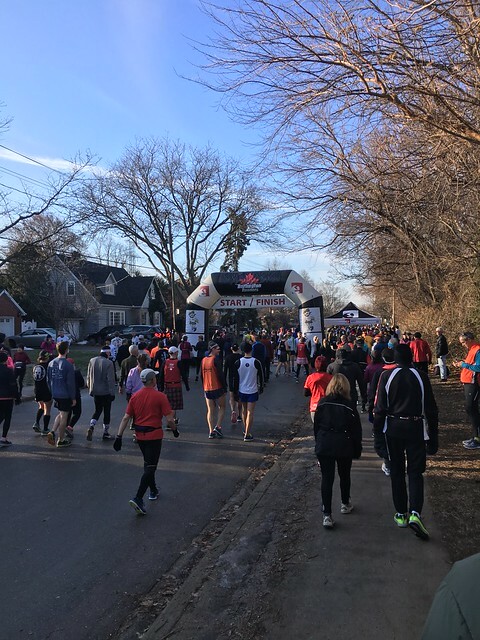 Organized by the Burlington Runners, this year marked the 39th annual race. It is always held the Sunday of the week of Robbie Burns Day. 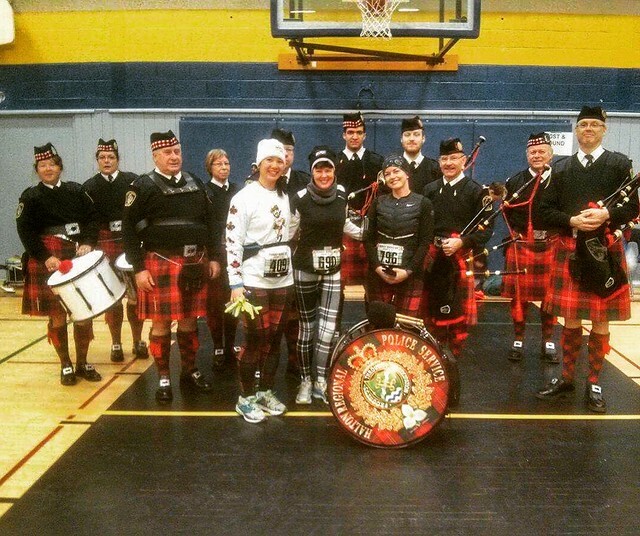 As you can probably guess from the race name, people also dress up in kilts, plaid and other Scottish clothes and costumes. Despite the fun nature of the race, it’s also a very fast field and the OMA (Ontario Masters Athletics) 8k Championship. The bagpipers lead us out for the race start in 2017. I had a disappointing result at my first Robbie Burns race in 2016. 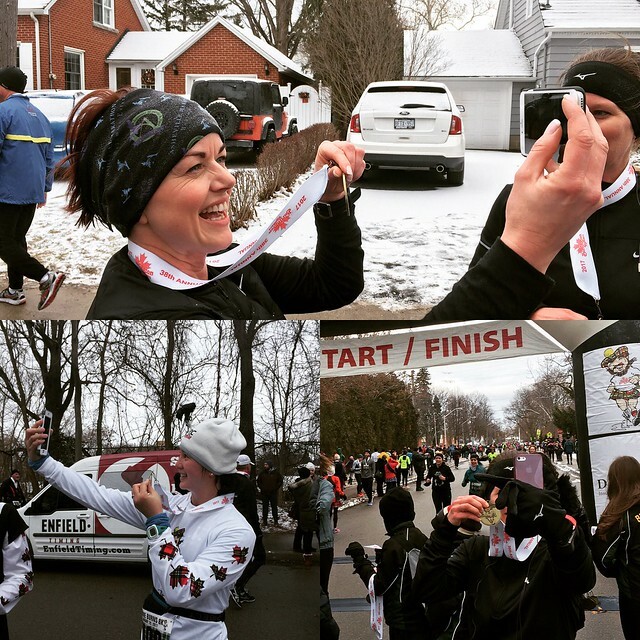 I had just run a half marathon PB and was feeling good. 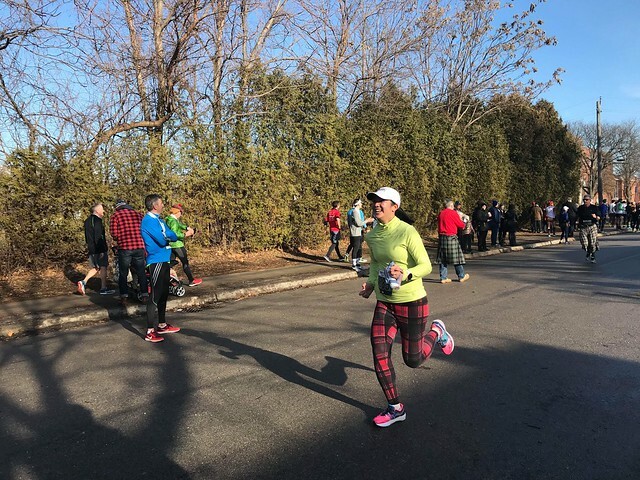 My 8k PB was set on the extremely hilly and challenging Spring Run Off course in 2015, so I thought given that Robbie Burns is flat, that I should be able to PB again. It didn’t go well and I ended up giving up and walking for part of the race. No PB. There was lots of selfie taking with the medals in 2017. Selfie with Jane, Sam, Nanlee, Cathy and me. Sam and I finishing the Robbie Burns 8k together in 2017. 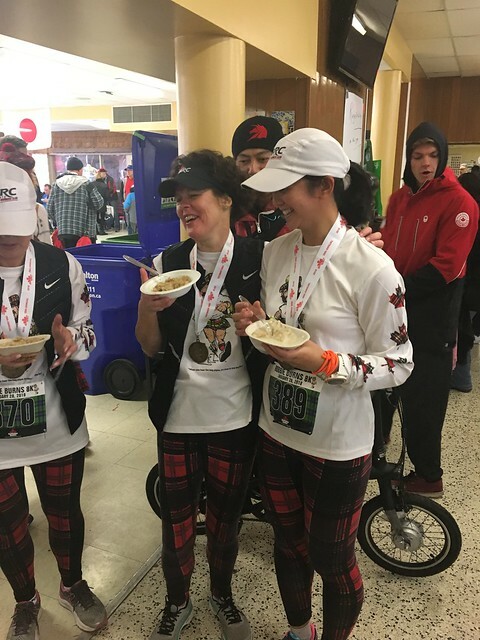 Photo by Burlington Runners. Me, Sam and Nanlee with the band in 2017. I think Jane was warming up. The Porridge Queens in 2017. So this brings me to 2018. First of all, the weather was perfect. Blue skies, sunshine, hardly any wind and it was 2C. We couldn’t ask for better race conditions. 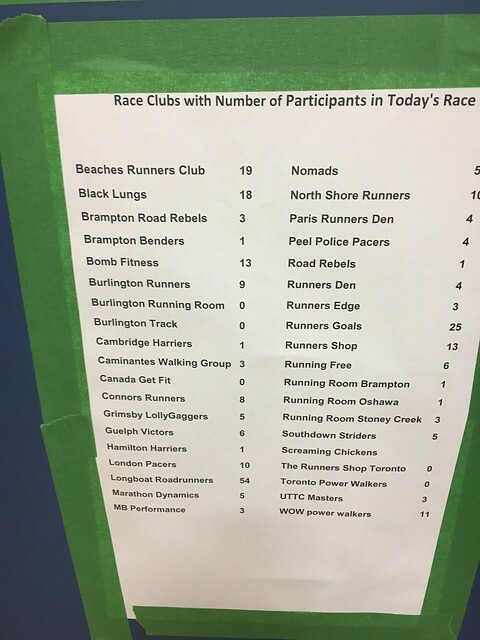 The other difference this year was the number of friends also running the race. I remember in 2016 and 2017 we hardly saw any familiar faces (we saw Cathy last year on the course, which was really exciting!). 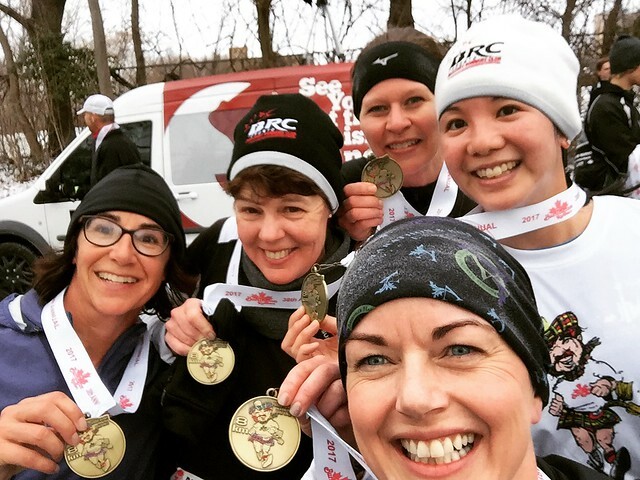 This year, several fellow Beaches Runners Club (BRC) members ran, as well as JP’s Team members including Nicole, Maria, Kate, Leanne, Allison and Michelle. Karyn, Dan and Cathy also cheered and we got to catch up a little with Edison, who was there to take pictures for a job. Dan and I before the race. He decided to come out and cheer this year. Sam, me, Nanlee, Karyn, Kate, Maria, Leanne, Allison, Dan, Nicole, Michelle and Cathy. Photo by Cathy. We picked up our race kits (another great feature about this race is race day kit pick up. This means we didn’t have to trek out to Burlington in advance). As usual it was a smooth process. This year’s swag item was a Robbie Burns pyjama top. Next year will be the coveted pants. I’ve wanted the pyjama pants ever since Tim told us about them in 2014! Me, Tim, Sam and Nanlee. Three of us are wearing this year’s pyjama top. 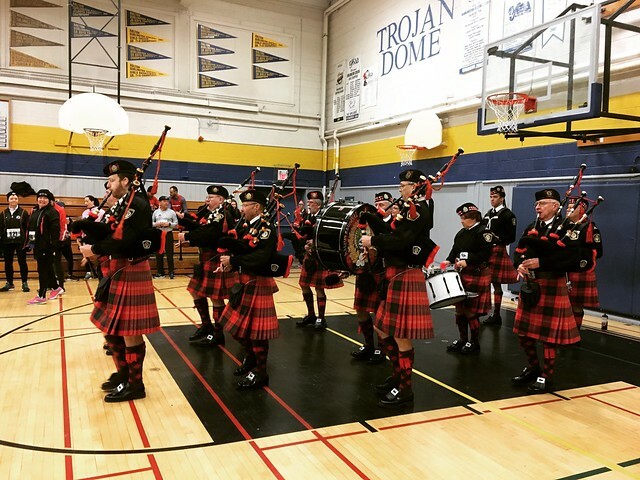 As always, the bag pipers started the race by playing and marching into the hallway. You get to walk past them as they play. We lined up behind the start line (self-seeded corrals) and found a sunny spot for Sam, who was in short sleeves. Allison was also wearing a tank, arm warmers, shorts and knee high socks. I envied both of them partway through the race as I dripped with sweat. They were smart. We all wished each other luck and started running. 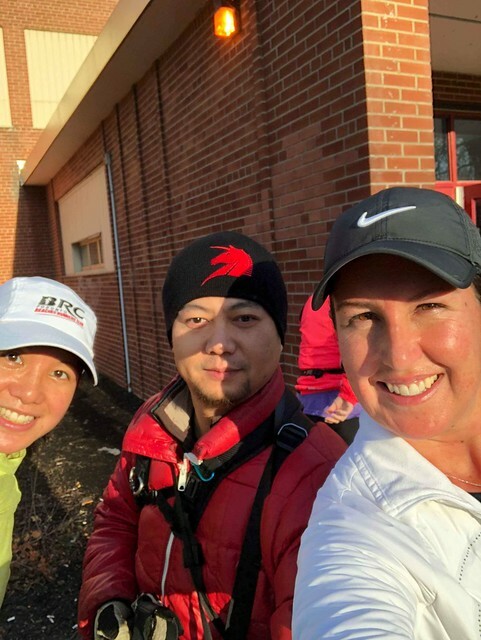 Selfie with Edison and Nicole after our warm up run. Photo by Nicole. The walk to the start. Perfect weather and lots of shorts. Cathy took this picture of us as we started running. It was really crowded at the start so I ran up the side to get around people and find some space. I don’t like being boxed in. As we hit the first kilometre my watch clicked and said that I was running in the 5:20s (min/km). This was a little faster than what I thought I’d do. My 8k PB pace was 5:35, so I was hoping to run a 5:34. I felt pretty good so decided to go with it. A few kilometres in I saw Nan speed past me. Around 5k I saw Sam go by and I told her I’d see her at the finish. The first 5k were good. I was running at a comfortably uncomfortable pace if that makes sense. I didn’t feel like I was dying, but I was running faster than usual. The last 3k were really hard for me. There were a few hilly sections and I found it challenging to maintain my pace. My pace fell by about 10 seconds per kilometre. I was ok with that because it was still below a 5:35 pace. Susan caught up to me and I told her she was doing good. She was running really strong and I knew this was faster than what she had planned as well. Then Olivia ran by and I said “Good job Olivia!” but she didn’t hear me due to her headphones. She told me later that she saw me and that I was “running fast!” I savored those words since “Mei” and “fast” don’t usually go together. For the last two kilometres I kept thinking “WTF! Where’s The Finish? 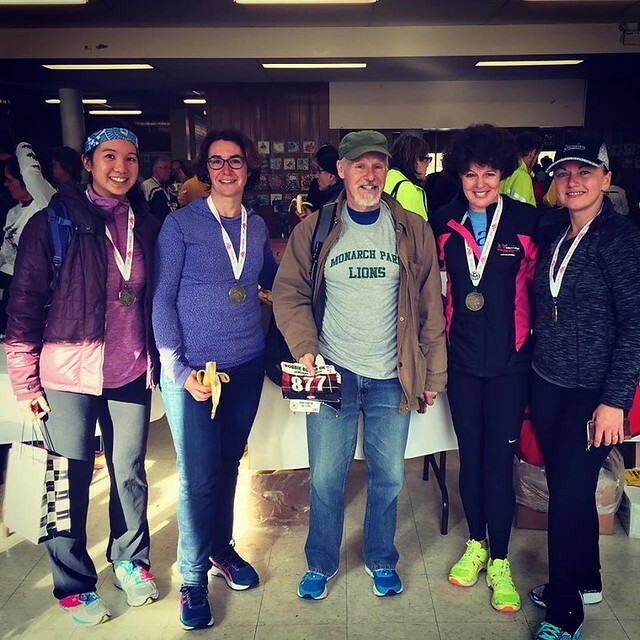 !” As we approached the final stretch I saw Nir and Allegra walking by and I waved to them. They cheered for me, which gave me a little boost. Then I ran down the last section (where I could finally see the finish line). I saw Edison, then I saw Karyn and Dan cheering and then I crossed the finish line. I got my medal and then went to talk to Cathy and Nan, who were by the finish. We all waited together and cheered in the rest of our friends. It was really great. Edison took this picture of me headed to the finish line. Karyn took this picture of me as I closed in on the finish. It was great to see her! Nanlee and I after finishing the race. 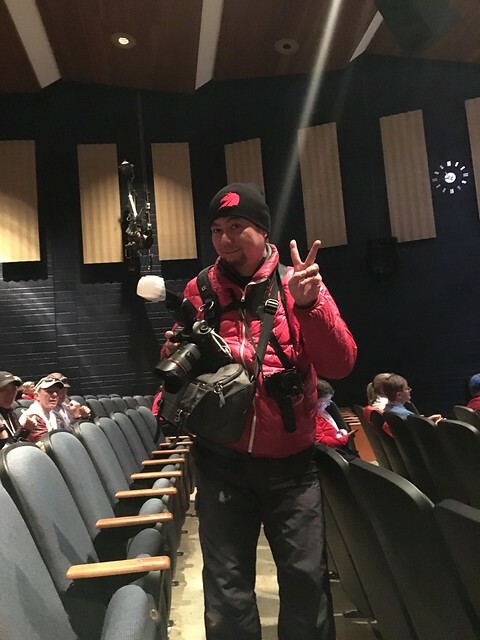 Photo by Cathy. 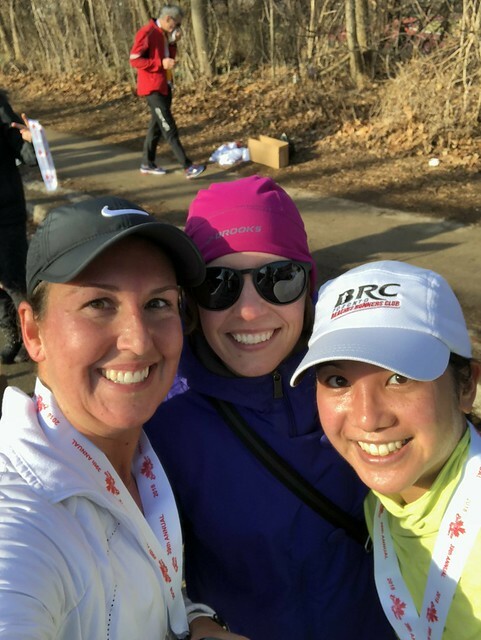 The Crazy Eights selfie with Nicole, Karyn and me (photo by Nicole). After the race we got our porridge and once again, nobody won any draw prizes. Oh well, maybe next year? Overall I was really happy with how I did. 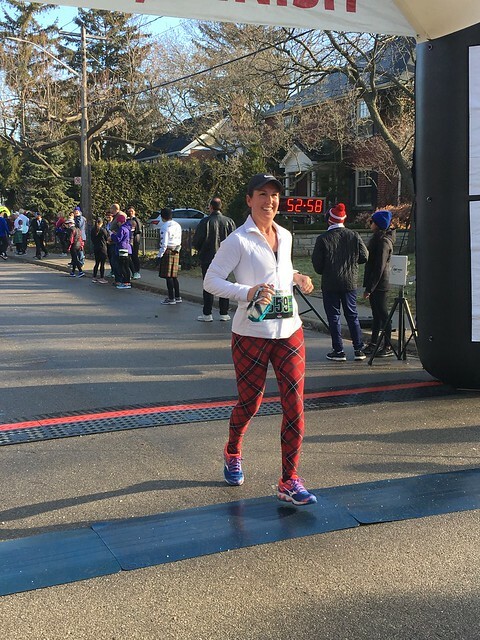 I finally ran a new 8k pb (43:52). Nanlee ran a PB, Sam ran a new course PB, and Larry and Maria both placed second in their age groups. Everybody ran strong. I was so happy to see my friends at the finish and that everybody seemed to have a good race experience. I’m already looking forward to next year (and to finally getting those pyjama pants!). Porridge photo outtake with Nanlee, Sam, me (and Edison behind us). The porridge did not disappoint! Nir, Nanlee, Susan, Sam, Edison, me.